I have almost completed all the projects I brought with me to Missouri. I finished the pillow shams for the sports quilt (that I forgot to take a picture of). I finished this Quilts of Valor. I'm calling it Stepping Up. It's a super easy pattern. I don't even remember where I got the pattern. I don't have it anymore but it's so easy, I remember how to make it. I will share my version of the instructions with you in a day or two. I changed the size up a bit from the original one. And you know I couldn't finish up projects without a Texas Quilt or a red, white, and blue quilt. I have had this quilt top 2/3 done for quite some time. I even had the flying geese cut out. I sewed them together, squared them up and set the blocks together in the cream section plus appliqued the star on the blue section and them sewed the three sections together for this "Pieces of Texas Flag". Of course, it will go in my Texas Beauties Trunk Show after it's quilted. Then I started cutting out the t-shirts for a T-Shirt quilt for my nephew. I have them all cut out and the tricot interfacing applied to about 2/3 of the shirts. I ran out of tricot interfacing though so I'm through with this project until it can get more. None could be found in this one horse town though! I also finished 2 projects for the upcoming "Wicked" Blog Hop. You won't want to miss it. I can't wait until I can show you what they are. Not only did I finish the 2 projects for the Wicked Blog Hop, but I also made duplicates of each project. I'm going to give away the two duplicates. 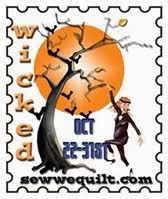 See, I told you that you won't want to miss the Wicked Blog Hop. Be sure to stop back in on my day to post to see how you can win. In the mean time, go so how Wicked others are being right now. You have been one busy girl Doris. Love your TX quilt!! Still no quilting here, to much remodeling still going on. I hope it will soon be completed!!! Love your Stepping Stones quilt! My SIL is a Marine serving in Afghanistan and I will be making 5 RW&B quilts to give after deployment. One for my DD and SIL and 4 more for his closest buddies and their wives. This looks like an easy pattern that will work-up quickly. Would you be so kind to give me the measurements for the bricks? I do not have a blog, but will check back on your site for the info. Thank you.